La Prensa is San Antonio’s only free bilingual newspaper, owned and operated by Tino and Millie Duran since 1988. As San Antonio’s source for positive community news, it has a longstanding legacy with the city’s hispanic community. In 2013, Tino Duran was diagnosed with Alzheimer’s disease and he withdrew from the paper’s day-to-day needs. In his absence, the newspaper was mismanaged and risked bankruptcy by December 2015. His daughter, Nina Duran, was given the opportunity to take over the paper as publisher and save its operations in January 2016. At the time, Nina held the position of Vice President of Sales & Marketing at HeartFire Media, a creative marketing firm in San Antonio owned by Samantha Najera. Nina and Samantha chose to partner the two companies and combine their resources to save La Prensa. The newspaper needed a major overhaul: its logo and website had not been updated in 10 years; its website averaged less than 300 pageviews/month; and the paper had 200 distribution points, but only in a few zip codes. Keeping the paper alive would require many changes to the status quo. Nina and Samantha’s gameplan was two-fold: one, to increase revenue and save the paper’s finances; two, to grow its audience by appealing to a younger generation of bilingual, tech-savvy millennials. Necessary upgrades included updating the website; modernizing the paper’s logo, tagline, and print layout; and expanding its distribution around the city. After merging the companies’ offices, Samantha and Nina strategized how the two companies would coexist. Samantha developed a business plan and timeline of strategic roll-outs for the year ahead. Staff roles were altered to fit the changes envisioned for the paper. 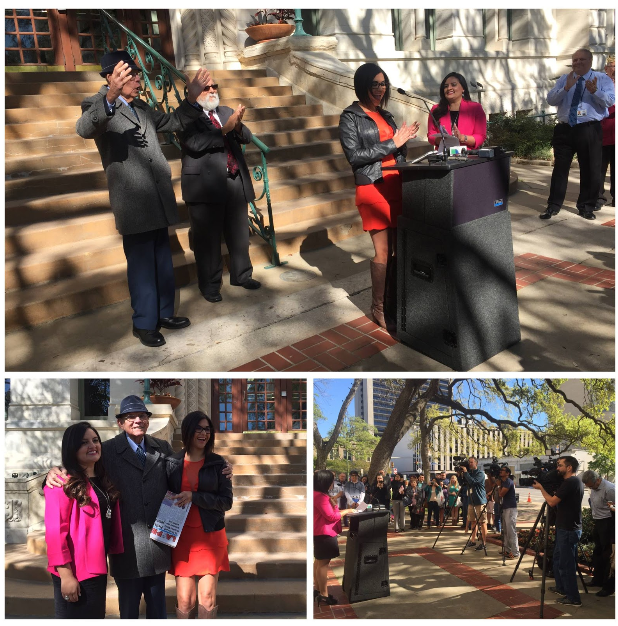 After finalizing the business plan and PR strategy, Nina and Samantha chose to publicly announce the upcoming changes via press conference in front of San Antonio’s City Hall. The goal of the press conference was to inform local media, city officials, and the general public about the new business partnership, their proposed changes, and Mr. Duran’s official retirement. Once granted permission by City Hall, the press conference was set for Monday, March 21 at 10:30 AM. Additional planning included creating La Prensa/HeartFire Media branded Fiesta medals for free distribution to all who attended the press conference. Nina and Samantha created a new tagline in both English and Spanish. La Prensa’s production staff revised the paper’s layout and created a new logo, both of which were rolled out in early March, along with the new tagline. HeartFire Media published a teaser about the upcoming announcement on March 3rd in their weekly e-newsletter, sent to over 1200 community leaders and business owners in San Antonio. HeartFire Media and La Prensa officially announced their business partnership on March 16 on La Prensa’s Facebook page, Nina’s personal Facebook page, and HeartFire’s e-newsletter. That week, Samantha was interviewed by Texas Public Radio, where she had the opportunity to discuss the business partnership and promote the press conference. The new Fiesta Medals were promoted on social media to encourage the community to attend the press conference. That week, city officials were personally invited via telephone. A press release was sent to local media outlets the day prior and the morning of the event. HeartFire Media’s Marketing Coordinator, Blanca Morales, facilitated live social media posts, including a Facebook Live video of the press conference, onsite Instagram posting, and tweeting of the event. Follow up interviews between the media, Nina, and Mr. Duran, were facilitated by Samantha Najera. Pear Analytics was contracted to build La Prensa’s new website. The website would reflect all the stories in the most recent print edition of La Prensa, as well as store PDF copies of all back issues. The website officially launched in May. A press release was sent to all local media outlets detailing the news of the new site. Nina worked closely with Distributek, the paper’s distributor, to find untapped locations around San Antonio where La Prensa could be distributed. The transition of leadership generated buzz around La Prensa newspaper, encouraged by media coverage of the press conference. Feature stories were published by the Rivard Report, the San Antonio Business Journal, and News Radio 1200. All local televisions stations covered the event, including KSAT 12, WOAI 4, Fox 29, Univision and Time Warner Cable News. HeartFire Media’s Facebook live video reached 20,947 people, generated 9,930 views and 321 reactions. The University of the Incarnate Word published an article in their student newspaper about the change in leadership at La Prensa. Their alumni magazine, The Word, published a follow-up feature on the partnership of the two companies in the summer of 2016. The campaign’s effectiveness was measured by La Prensa’s digital revenue and the growth of its distribution locations at the end of the year. By December, the newspaper’s distribution had doubled to 400 locations, including all H-E-B stores, Jim’s Restaurants, 7-11 stores, and Whole Foods stores in the San Antonio-Boerne area. New digital advertising opportunities on the website amounted to over $7,000 in additional sales revenue in 2016. The new website now averages 3,000 pageviews/month. New digital advertisers include H-E-B, University Health Systems, Alamo Community Colleges, and CPS Energy. Other partnerships established after the paper’s changes include the DoSeum, Amazon, Spurs Sports & Entertainment, and the San Antonio Missions.